There’s something about homemade curries that always leave me coming back for more. The flavour, the colour, the warmth and the different ingredients. You’ll never catch me ordering in a takeaway curry now that my outlook on food has completely changed since going Primal. To me, food is something to be valued and given a thought into. I absolutely love getting in the kitchen with my family and creating dishes that are not only good for the body, but good for the soul too. When I say ‘soul’ what I really mean is creating a dish that provides you with joy when you get in the kitchen – seeking pleasure out of the food you’re cooking for your family. That’s what cooking delicious food should be about, right? Being proud of the food you not only cook, but eat too! 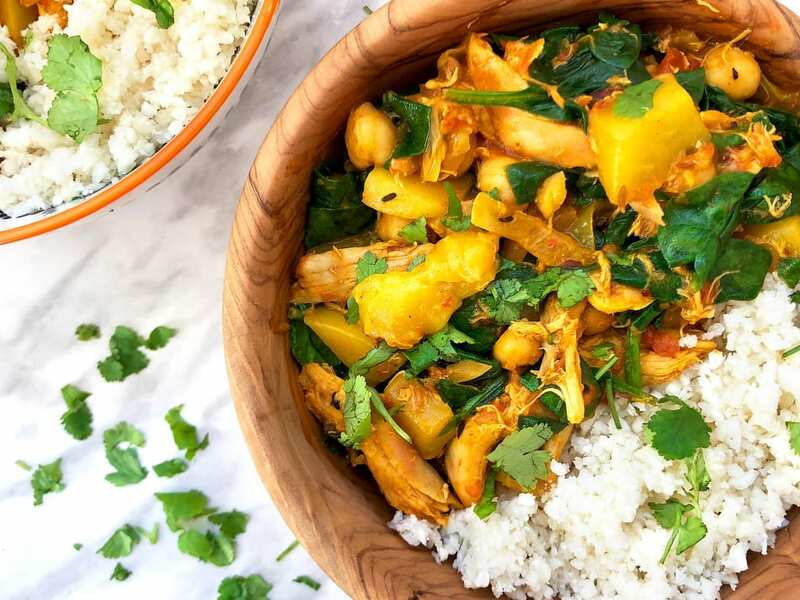 This chicken, chickpea and sweet mango primal curry is one of my family’s favourites. It’s a delicious combination of sweet and spicy (just a hint) and has a lovely amount of creaminess – thanks to the coconut milk. Coconut milk, unlike cow’s milk, is completely lactose free, which also makes this a dairy free curry. While Primal Cure is not anti organic cow’s milk, coconut milk is definitely more beneficial to our overall health. The milk itself is produced by grating the coconut flesh and then soaking it in hot water. The thick cream rises to the top where it is then skimmed off and the remaining juice can be filtered and bottled as milk. Coconut milk is hugely beneficial to our overall healthy because it’s the richest source of medium-chain fatty acids (MC- FAs), which is the closest thing for sale in a can or bottle to human breast milk! However, as coconut milk is very dense I don’t recommend drinking it like cow’s milk. Even though we don’t count calories, if you do want it as a stand-alone drink, just go for half a glass. Even this small amount will provide you with 25g of healthy fat, plus a good dose of manganese, copper, phosphorus, magnesium and iron. Which means, you’re getting a few health bucks with this curry. 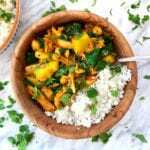 Two other health ingredients I’ve included in this dish are turmeric and ginger. Both are the perfect ingredient to ad – especially this time of the year where many people are suffering with the flu or other dodgy illnesses! I discuss in more detail the benefits of turmeric and ginger in my book, Primal Cure. So be sure to check that out and how Turmeric can be used to help prevent illnesses such as Cancer! Personally, I believe this curry is everything a curry should be. It’s full of flavour, comforting and nourishing. Pair it with some cauliflower rice and you’ve got the perfect Primal dinner. 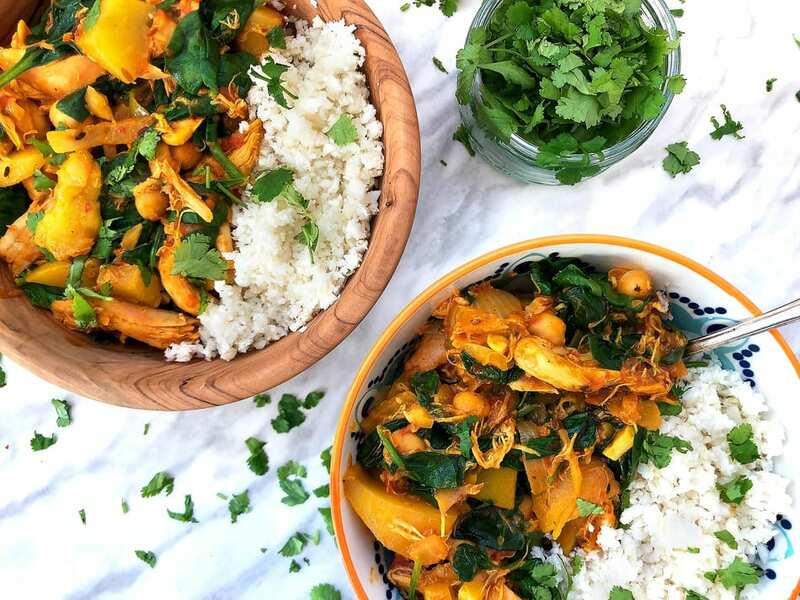 Who say’s you can’t have a curry that’s not only delicious but good for you too? Not me! Go on, give this one I go. A deliciously sweet and spicy healthy curry with a good dose of creaminess. Begin by heating a large pan with extra virgin olive oil. Heat until hot and then add the cumin seeds and toast them for a few minutes. Be careful not to burn them! Add the onions and cook until brown. Add the ginger, garlic, chilli flakes, coriander and turmeric and leave to cook for a few more minutes whilst stirring. Add the cooked chicken, chickpeas, tin of tomatoes and coconut milk, stir and bring to the boil. Add the salt and season with some pepper. Leave to simmer for 10-15 minutes. Whilst this is cooking, cook your cauliflower rice by popping it in a pan with a little extra virgin olive oil on medium heat. Cook for 5 minutes. While your cauliflower cooks add the mango to the chicken. Once done, add the spinach to your curry and leave it to wilt for a few seconds/minute and then stir into the rest of the mixture. Serve with the side of cauliflower rice just before the spinach becomes too limp. Enjoy! You add the mango to the chicken while cooking the cauliflower rice. 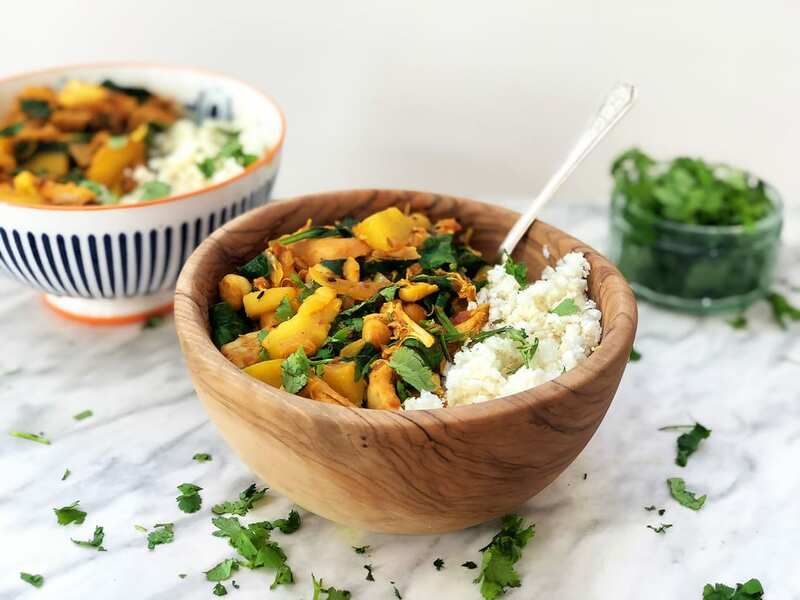 When do you add the mango to the – chicken, chick pea and sweet mango curry please?